While working on this project I have been following closely the e-Nable facebook page and blog. Reading up about recent testimonials and new hands that have been/ in progress of being designed. Last week there was one that caught my attention. Pat Starace has recently finished designing an Iron man themed children’s prosthetic hand. The hand does not just include the colours of Iron man but many other features too such as a laser, thruster, voice activation and LED lights cycling through animated patterns in the palm. Something else that I think makes this hand extra sleek and aesthetically appealing is that all the cords etc have been hidden away and covered up, unlike the hand I am making where it is all exposed. Just as I think I have seen it all, someone comes up with yet another idea pushing 3D printed prosthetics to the next level. The link to the article is: http://3dprint.com/19219/3d-printed-iron-man-hand/. In the article there is a youtube clip showing all the features of the hand and how it works. Ray – Helping with the research, scaling, modifying and assembly of the prosthetic hand. e-Nable – Supplying me with the digital files and instruction manuals for putting the prosthetic hand together. Shapeways – Checking final files and printing for me. After all the research I have done on 3d printing and prosthetics, I have gone through and made a list of the key ideas and facts that have stuck out to me and that I think are strong messages to be shared. – 3d printing is becoming the answer to many problems and solutions. – It is a technology almost capable of achieving anything and already is advancing way ahead from just printing models. Now printing food, prosthetics, mechanical parts the list goes on. – Any one is capable of 3D printing and now owning a printer is becoming cheaper and cheaper. A basic one can cost you just a couple 100 US dollars. – You don’t need fancy expensive software to make something basic and get it 3D printed and there are also many 3D apps available online for people to use. – You can now get 3D scanners to then make a model from your scan. These can be pricey so instead you can take multiple photos in two loops at different angles to achieve the same result as a 3D scanner. – The materials you are able to print with is continuously growing. Some include, pasta, chocolate, plastic, ceramics, gold etc. – 3D printing is huge for the production of prosthetics. This technology is allowing people to be able to afford news limbs etc. Prosthetic hands are being able to be made by individuals at there own home for as little as $50 and the 3D printed hand is giving them more movement, strength, better grip, and the option of personalising their own hand (colour, attachments, fit) than a prosthetic hand prescribed to them. There are many options for printing. Some places that I have become aware of include Sculpteo and Shapeways, both of these places ship worldwide with reasonable prices and have 3D apps available for you to use. They also have online assistance available to you, as well as a massive range of materials including but not limited to plastic, brass, steel, bronze, silver, sandstone, ceramics, platinum and castable wax. 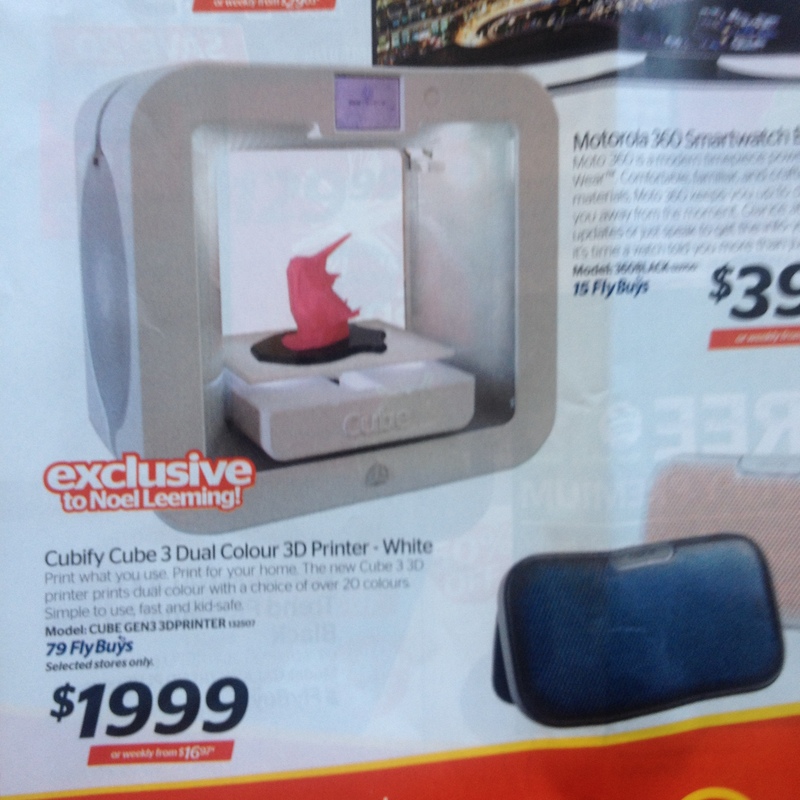 Of course purchasing your own 3D printer is becoming cheaper to do now as well. Prices ranging from anywhere between $100’s and $1000’s. Buying a basic 3D printer for hobby use can be very cheap especially in countries like the USA, Canada, China and Singapore. Costing as little as $150. Something more and more people are doing is purchasing themselves a small 3D printer and then printing pieces using it to make their printer bigger. In New Zealand owning a printer is a lot more expensive as we aren’t quite as advanced in this technology compared to the rest of the world. I found a mini 3D printer advertise at Noel Leemings. It is a pretty basic printer but it still costs so much to own one here in New Zealand (shown below). This makes me feel like 3D printing a prosthetic hand is more achievable than I thought. If she can , what’s stopping me? I have been watching a few videos and keeping up to date with their posts, seeing what new hands they are creating and coming up with. Here are a few of my favourites. The 3D Printed Light Show Hand! 3D Printed Prosthetics.. with a Wolverine Hand! 3D printers are becoming the answer to our needs in the manufacturing world and production of products. As mentioned in an earlier post 3D printers are capable of producing so much but something that is really growing in the 3d printing world is using this technology for the production of prosthetics. This technology is allowing people to achieve more things, even things that other prosthetics haven’t allowed them to. This youtube clip is a story about a man who has a $42000 hand and gets given a $50 3D printed hand to try out. He discovers that the 3D printed hand actually gives him better grip and movement. Allowing him to do an even bigger range of tasks. The 3D printed hand may not last him as long as his $42000 hand but at only $50 it definitely is more affordable for him to keep replacing it. 3D printing also known as additive manufacturing is a process of making 3 dimensional solid objects from a digital file. This is achieved by an additive process, this means the object is created by laying down successive layers of material until the entire object is created. Each layer can be seen as a thinly sliced horizontal cross-section of the object to be. Below is a diagram summarising the process of 3d printing, the history and the future of this technology. To view click on it and then zoom in. (3D Printing, n.d.). Its safe to say 3D printing is rapidly becoming the answer to many problems. Prosthetics is basically the process of design, construction, and attachment of artificial limbs and other systems to replace the function of missing body parts usually lost through (but not limited too) trauma, disease, or congenital conditions. Prosthetics isn’t a new development to the world. One of the earliest mentions of it being used was in the Greek and Roman times. One example, Marcus Sergius, a roman general lost his right hand while battling in the second Punic War. He had his hand replaced with an iron one for the purpose of holding his shield. This allowed him to return to the battle and continue fighting. More recently in 2000, researchers in Egypt, found what they believe to be the oldest documented artificial body part. 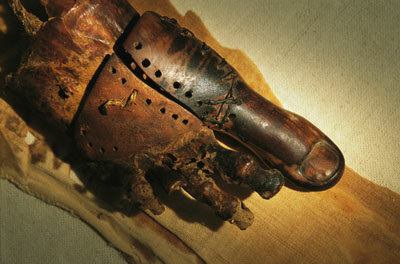 It was a prosthetic toe made of wood and leather (image above). It was found attached to a nearly 3,000 year old mummified remains of an Egyptian noblewoman. Prosthetic devices were constructed by materials such as wood and metal, and held to the body by leather attachments. It is only in more recent times that prosthetics have grown and changed, now being constructed from plastics and becoming more robotic like. These materials can make a prosthetic limb lighter, stronger and more realistic. Electronic technologies are also making the more advance prosthetics of today more controllable and even capable of automatically adapting their function during certain tasks, for example gripping and walking. 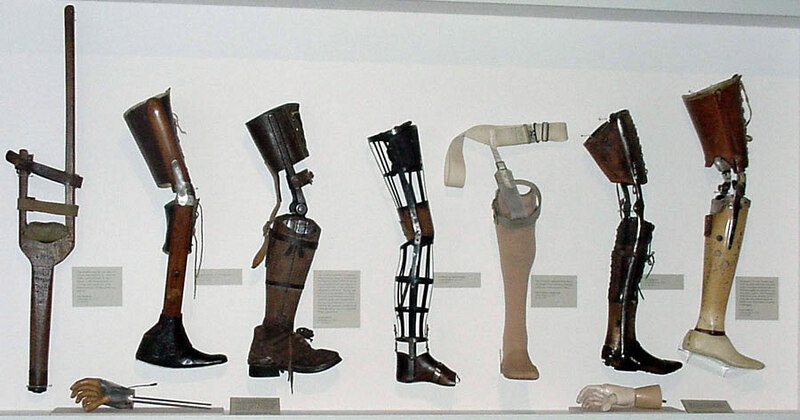 While new materials and technologies have modernised prosthetics over the past century, the basic components of prosthetic limbs remain the same. (Clements, n.d.). Just to give abit of an idea of how prosthetics have developed over time here is an image I found on google images. It is specifically looking at legs. The following video shows just how prosthetics are changing peoples lives and how far they have developed from the above examples. This link was sent to me by one of the people who are helping me with this project. I find it pretty unreal that someone who lost a leg and thought they would never be able to dance again can now go back to dancing all thanks to technology and someone caring. The guy who lead this project is just waay cool. The fact the he himself has two bionic legs and came up with numerous ideas as solutions for giving himself new legs and then succeeding is pretty mind blowing stuff. This stuff is just two exciting. Not really knowing where to start with this project I have come up with a fews questions to then go away an base my research on. The people I have asked to be apart of the project are also going to pass on any research they collect too.